In medium skillet, toast almonds over medium heat for 2 to 3 minutes or until light golden brown, stirring frequently. Add margarine; cook until margarine is melted and almonds are golden brown, stirring constantly. Add cookie crumbs; mix well. Cool 15 minutes or until completely cooled. Line 8x4-inch loaf pan with foil. Spread 1/2 cup cooled crumb mixture evenly in bottom of foil-lined pan; press down lightly. Evenly spread half of the ice cream over crumbs. Top with remaining crumb mixture; press down lightly. Stir ice cream topping to soften. Spoon topping over crumbs; carefully spread almost to sides of pan. Evenly spread remaining half of ice cream over topping. Cover; freeze at least 4 hours or until firm. To serve, unmold ice cream onto cutting board; remove foil. Cut into 8 slices; place on individual dessert plates. Top each serving with whipped cream and a cherry. 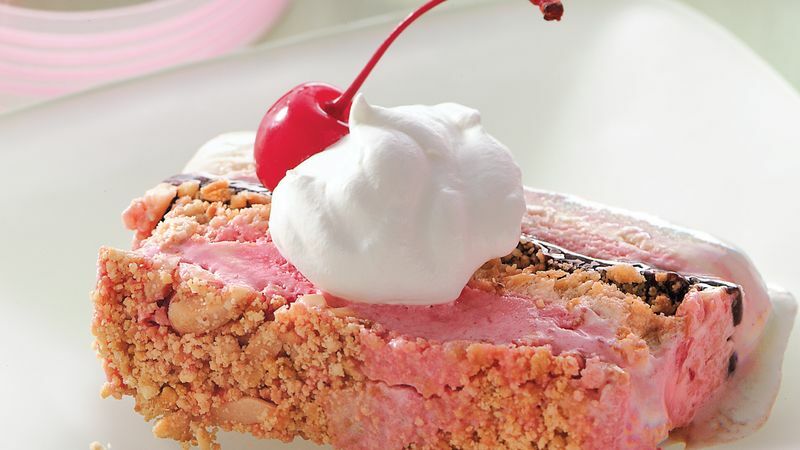 Use your favorite ice cream in place of the spumoni. Try Neapolitan; it has equal parts of chocolate, vanilla and strawberry, or try a single flavor. Hot fudge ice cream topping varies in consistency. Choose spreadable hot fudge for this recipe. Use room temperature topping and stir it until the texture softens enough to spread. Put this dazzling dessert together up to three days ahead. For easier slicing after long freezing, let the dessert soften in the refrigerator for 30 minutes before serving.